Another bumper rice harvest is forecast for China this year, with the crop increasing 0.6% from last year’s record. The photograph above shows early rice being planted in Guangxi–and a reminder that it is still back-breaking work. Meanwhile, imports are expected to rise and exports to continue their decline of recent years as the country rebuilds its stockpile of reserves. In its latest world rice outlook, the U.N.’s Food and Agriculture Organization (FAO) predicts the 2012 harvest will come in at 202 million tonnes of paddy (138.4 million tonnes of milled rice), up from 2011’s official forecast of 200.8 million tones of paddy (137.5 million tones of milled rice), which was a 3% increase on 2010’s harvest. The FAO’s optimism follows concerns that the persistent drought the southwest was threatening this year’s harvest. The slowing rate of expansion of the harvest, the FAO says, “reflects rising costs of fuel and other inputs, which would dampen the positive effect of a 9%-18% increase in support prices.” As we have previously noted, China may be bumping up against the ceiling of its rice producing capacity. Beijing is directing more than four-fifths of its agricultural support budget of 1.2 trillion yuan ($190 billion) for this year to grain farmers (who include wheat and maize growers) to sustain the record levels of grain output and increase rural incomes. 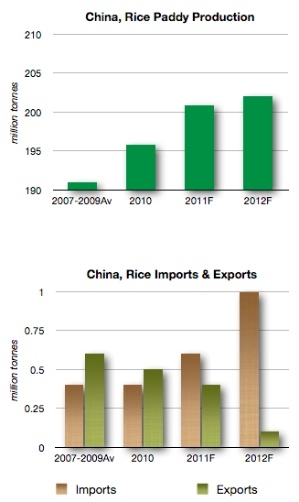 Regardless of the bumper 2011 harvest, rice exports are expected to fall from 2011’s 516,000 tones to 400,000 tonnes this year (see chart). This reflects officials responding to domestic price inflation, particularly politically sensitive food price rises, by curbing sales abroad to restock domestic reserves. In addition, exports of China’s lower quality Indica rice are becoming less competitive, particularly in its African markets, where it is anyway looking to supply locally. For example, Chinese farmers will start growing rice on 25,000 hectares in northern Sierra Leone this year. Imports are likely to rise. High domestic prices and supply shortfalls in drought-stricken southern provinces prompted large purchases by Chinese buyers, mostly from Pakistan and Vietnam, the FAO says. This has caused it to raise its 2012 import forecast from the 600,000 tones it had expected in January to 1 million tonnes. The FAO predicts that end-of-season stocks this year will rise to 83.1 million tonnes, up from last year’s 75.4 million tonnes.